I'm annoyed at my options for version control. When I share a Google Doc, collaborators overwrite my master copy. It's insanely difficult to accept individual changes they've made. Sometimes I don't have anyone to assist in editing my document, but I could really use some help. Draft has a magic "Ask a Professional" button. One click, and you can send whatever you're working on (Christmas letter, cold email to a potential customer, blog post, etc.) to a staff of reviewers to get suggested edits. Draft makes it easy to ignore or merge in their changes. Do what you want with them. iCloud and Google Docs make it very difficult to find previous versions of your work. They end up saving a lot of arbitrary junk. How can I find an old draft that has a certain paragraph I ended up deleting and now want back? I have a ton of fragments of writing in cloud tools, like Evernote, but it's not an ideal place to do long form writing. You can solve that with Draft. Import your documents from cloud services like Dropbox, Evernote, Box, Google Drive. Using Draft, edit these documents, share with your friends, and manage your friends' suggestions. Anything you do to the document is automatically synced back to your cloud account where you imported the document from. For example, start a blog post on the bus with Evernote, then sit down at home, use Draft to complete your blog post and get feedback. You'll always have that complete copy back in your Evernote account. Draft documents can easily be published to Wordpress, Tumblr, Ghost, Svbtle, Blogger, Twitter, LinkedIn, Basecamp and even Mailchimp from inside Draft. Go to Settings -> Places to Publish. You'll then get a Publish button next to your documents. Bookmarklets and browser extensions like Instapaper, Evernote's Clearly, and Readability make reading anything on the web simple, focused, and gorgeous. Why can't writing be that way? So here's a Chrome extension that lets you. When you're done, there's a menu button to paste your work back into the text box you came from. To further extend Draft to publish anywhere, you can setup WebHooks. WebHooks integrate themselves into a Publish button on your documents. When you publish to your WebHook, Draft will send your application a JSON payload of your document. Here's more documentation on WebHooks. Email is still the most used and convenient app on my mobile phone. So I've created a way to create a new document in Draft simply by emailing a secret address on your account. I can't believe how much of a pain it is to transcribe even a short amount of audio. In order to write better, I've wanted to start including more transcriptions of podcasts, video presentations, and interviews in my writing, but the tools are in bad shape. I found myself using iTunes for the keyboard shortcuts, but I'd have to flip back and forth to edit the text I was transcribing. Now Draft can assist you with your transcription. The "New Document" button has a dropdown arrow next to it to start a "New Transcription". It's been insanely handy. I used it to quickly transcribe a Vimeo video for a blog post. And people have been using it to transcribe interviews for their books and articles. There are so many software systems for Task/Todo lists. But it's funny how unportable those Todos are from system to system, unless someone spends time with their APIs. I really like what Github did. They created a style of Markdown that can be easily understood as a Task/Todo list in plaintext, but also easily parsed by software. 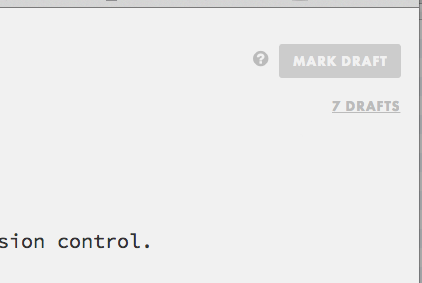 So in the spirit of spreading this, Draft now supports Github style Markdown Todos. I keep multiple Draft tabs open now, with one of them being a Draft Todo list. Which will create a new Todo for you. I needed to create a presentation the other day, but found it was strange I was reaching for heavy feature-laden apps like Keynote or Powerpoint to simply display some big text on the screen. Why do I have to click so much to create new slides, when really I just have 12 bullet points I'd like to outline and be done with the presentation? Not to mention - it's extremely difficult to version control and collaborate on a presentation. It's just a simple presentation tool, inspired and powered by Tom MacWright's Big. Draft's origin came from pain I had trying to version control my own writing. Today, here's a neat addition. Often I'll be working on a paragraph (or even a Tweet), and I'll want to see what a new version of the paragraph looks like. So I'll duplicate the paragraph inside my document to keep the old one around for reference. If you are a software developer you are very familiar with the idea of "commenting out" code. You might comment out some HTML to see what your user interface looks like without it. You might comment out some backend Python to refactor it. You comment out these things because storing, deleting, then finding them again even in "version control" is too much friction. Use the '<<' link to auto-insert the text back into your document. Draft saves details of the original location of the commented out text to try and insert it back to an appropriate place. Often I go to my wife. She's awesome at helping me write more concisely, but she's busy. So I created a way for Draft to help simplify my writing automatically. You aren't going to agree with deleting some of these sentences. But even the sentences you don't delete, might be good places to manually simplify. Draft isn't just an online editor. My goal is to make us better writers by investigating the tasks we have as writers and making those tasks simpler and easier. One mistake I keep seeing people make, when they publish their writing, is that they don't pay enough attention to attributes that might affect how much traction that writing will get. They'll publish 2000 word posts, when their audience would prefer 500. Or they publish on Friday night, when no one might be paying attention and Monday morning might be a better idea. I wanted to make this type of analysis a lot easier to understand, and help people, including myself, learn what makes our writing get more attention than other writing. There's a Reports button on your home page. If you click that button you can add any publicly accessible RSS/Atom feed to get a report like this. What the report tells you is how many Tweets on average your published writing is getting, broken up by various data points: when you published, what day, post length, and reading level. And you can see what attribute is outperforming others. Draft is using the Flesch reading level. The higher the number the lower the reading level. From Wikipedia, "90.0–100.0 is easily understood by an average 11-year-old student. 0.0–30.0 is best understood by university graduates." This way you can see if the audience that likes to follow your writing might prefer days when your writing is more or less sophisticated. You might see some trends in your writing. Maybe you shouldn't publish on the weekends? Maybe publish in the mornings? Maybe you should make your writing a little easier to understand? Maybe it's too short? Or too long? There's a lot of neat possibilities to explore with this report. Click the comment bubble in the lower right corner. You can also add comments with the new action menu at the top right. Comments are context aware. If you quote text from your document you'll see it underlined in your comment. Hover over that quote, and you'll see where that text is in your document. Also, if a collaborator quotes text in their document while writing a comment, you'll see those comments in your compare view. What's great about these Team Folders is that you don't have to send around Share links anymore to the documents inside. Your collaborators sharing a folder will automatically get updates of your documents or any new documents you create. You'll get their new documents as well. Any edits they make to your documents will automatically be setup so you can approve or reject their changes. They also can't delete your copies; your collaborators are working, editing, deleting their own versions. I've been making websites for over 15 years, and there's still too much friction creating a simple site and keeping it updated. That's a reason I haven't kept Draft's Features page updated. And for the Job Board, I didn't want to create a full-blown application yet, until I figured out what people needed from it. Pick your own subdomain and Draft will host your folder as its own site. Name a file "Index" (or move it to the top of your documents in that folder) and that's the document people will see going to your subdomain. The other documents in that folder each get their own permalink you can use. You can add your own CSS if you want to get fancier. To override styles I've defined, add your styles to a document named "override.css" in that folder. If you want to start your styles from scratch and have full control, name the file "main.css" instead. 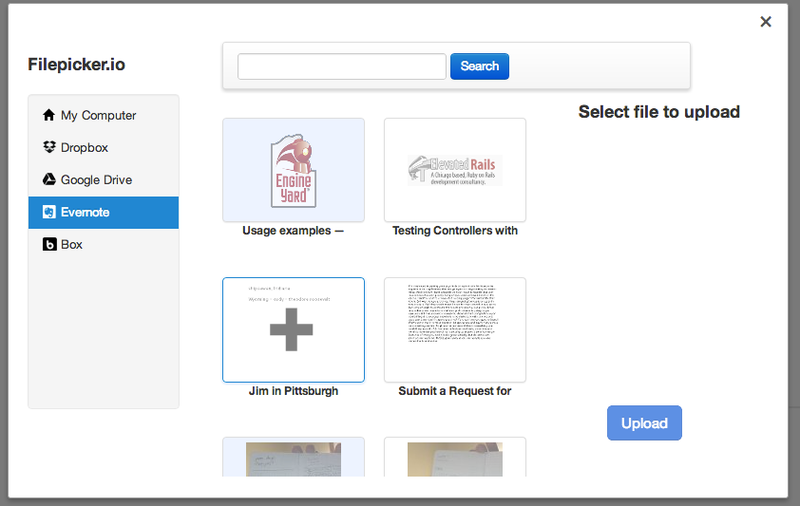 You can now easily add images to your documents. Just use the menu again at the top right, or Shift+Ctrl+I. Pick an image from every cloud service or your local computer. Draft will host your image for you and properly format the image to embed it nicely within your text. Click on the word count at the bottom right of the page to flip it into a character count. What's really neat about the count is that the setting will carry over to collaborators. So if you are working on a 500 character email in character mode, your collaborator will also get put into character mode. The best advice about creativity I've ever received is: "Write drunk; edit sober" - often attributed to Ernest Hemingway. I don't take the advice literally. But it points to the fact that writing and editing are two very different functions. One shouldn't pollute the other. It's difficult to write if you're in a editing mindset and removing more words than you're putting on the page. So I've added Hemingway Mode to help. Draft will turn off your ability to delete anything in your document. You can only write at the end of what you've already written. You can't go back; only forward. To return to normal mode, use the same shortcut to turn Hemingway Mode off. It's helpful in creating that rough first draft. Draft has a REST API to add it to your own tools and workflow. That's just a little of what you can accomplish with Draft. There's a lot more in store. Give it a try.